As I mentioned earlier in one of my blogs that internet is a must to make my Wind a perfect mobile solution. 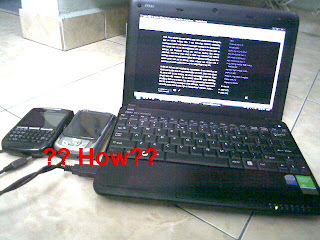 Wireless@KL and other free Wifi services at cafe like Starbucks seem to be good for me to go online, but I don't consider those as "mobile" though, they are "static" (but wireless) since I can't carry them with me wherever I go. I asked myself this question even before I got my Wind: where and how do I carry the internet in my pocket? I have an 3G BlackBerry 8707 and an EDGE HP rw6828 Windows Mobile phone which I carry daily. Both on Maxis. I've been using both of them to go online before I bought the Wind. The experience ain't the full internet experience you have with your PC or laptop. Name the few, screen size, input method, YouTube support etc and other Web2.0 applications. This was one of the reasons I bought Wind, and now how do I hook up my Wind with either of them? 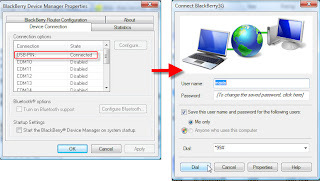 The issue to resolve right now was mainly on Blackberry, Windows Mobile is just few clicks away as below. My attempt to use the Blackberry as modem last few years ago when I first have it was a failure, it's because the Canadian company locked down the feature. X-( However, I guess I was a bit in luck, my peer told me that the company has unlocked the feature and released drivers for it. What a good news! I browsed to the download site. After few clicks, I found the software but there were so many varieties. After reading through few technical forums, I was pretty confidence a slim version of the software, the Blackberry Device Manager should be enough. Desktop Manager is not necessarily needed since I am not using it to load applications, backup/restore etc. +cgdcont=1,"IP","unet" if you have activated 3G service. +cgdcont=1,"IP","net" if you have not activated 3G and still on GPRS/EDGE. 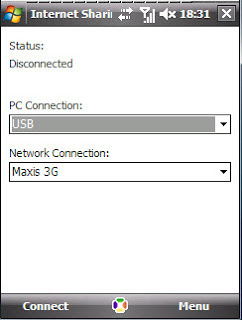 I launched the Blackberry Device Manager, it showed connected. Launched the dial up connection and click Dial. Mission accomplished! Make sure latest ActiveSync (v4.5) installed, or Mobile Device Center 6.1 for Vista. On the PDA, go to Start - Programs - Internet Sharing. Hook up the PDA to the notebook and start browsing!